Since colour-coding may only be appropriate to certain vocabularies (e.g. categories) and not others (tags, perhaps). 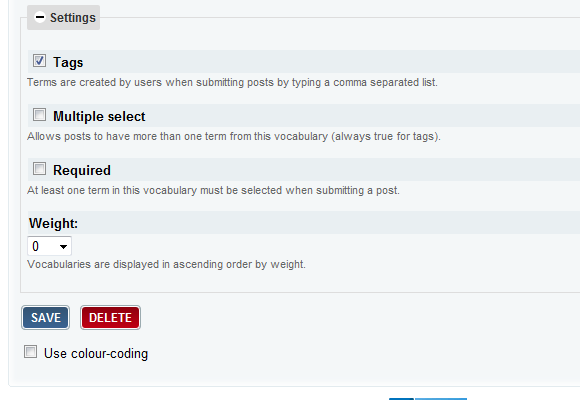 We need to provide the user with the option to specify which vocabularies are applicable. The user needs to be able to specify a colour when adding or editing a term, where appropriate. We need to provide a mechanism which allows the colour associated with a term to be stored, retrieved, and to be displayed. Later, I'm going to want to incorporate the colour in views, as well as consider some performance aspects. The next thing, then, is to start coding the module and this will take place in the PHP file we created in part one, taxonomy_color.module. So, let's start implementing the function by adding the form element. I won't go into the mechanics of the Drupal Form API - you may wish to refer to the Form API Quickstart Guide - but we're basically adding a new element called color, which is a checkbox with the given caption (the t() function - which stands for translate - allows us to localise our titles and messages). Now, the other element which so far I've just skimmed over - the default_value element. In truth this is probably easier to think of as an initial value; when adding a new vocabulary it's a default value but when editing it's the current value. But before we can set this value, we need to decide where it' going to get stored. If we're editing a vocabulary (rather than adding), the vid is stored in $form['vid']['#value'] - do a var_dump() to see this - so in the first case, we find out the current value for the given vocabulary, first appending the vid to the key. The second argument to the function variable_get specifies the value to return if the key in question doesn't have a value - 0 (false) seems a sensible default. If the vid isn't set then it- a new vocabulary, so let' set it to false. We're interested in vocabularies right now - but we'll use a switch here because in a moment, we'll be looking at terms. Another switch decides what to do based on the operation; setting the variable we defined previously on an insert or an update, and if we're deleting a vocabulary then let's keep things tidy by deleting the corresponding variable. So by applying the same logic as before, our function name becomes: taxonomy_color_form_taxonomy_form_term_alter By inspecting the form we can see that the term ID (tid) is stored in $form['tid']['#value'], so we can check for a colour associated with that term ID, otherwise defaulting to black (hex 000000). This is shown in the snippet below. Note that before we modify the form, we check whether the vocabulary of this term uses colour-coding; whether editing or adding a brand new term the vocabulary is, by design, already specified and is stored in $form['#vocabulary']['vid'] so we use this to check the value of the relevant variable. So, that's the form modified, but we still need to store the colour in the table we created. Here we'll go back to our implementation of hook_taxonomy(), and add a clause to the switch statement to pick up on term changes. // Delete old color before saving the new one. As you can see, when we delete a colour held against a term and add a new one, we clear any record for this term from the cache, where the key is taxonomy_color:tid. The second parameter of the call to cache_clear_all is the name of the table used to store the cached data. Note that I could / should use drupal_write_record here, but I'm going to keep it simple for now. Below, you'll find the module in full, at least up until this point. // We're only interested in term changes. In the next part, I'll complete the module by implementing caching fully, and then adding Views integration. Thanks for details.need more clear description. Thanks for the great write up so far … hopefully you’ll be able to do part 3 some time soon. Really impressed! Whatever are the explanation very open and very clearly the issues?